Olive oil for babies? -- I have 2 children. When my son was a baby he's been experiencing all skin-related symptoms all too common among babies. He's had baby acne on his face. He's had diaper rash, cradle cap on his head. It's a great knowing there are natural ways to alleviate these common symptoms. Can you say, "Extra-Virgin Olive Oil! Try some of these amazing remedies for your baby without using any harsh chemicals or medicine. As a mother, you'd be happy about your baby's well-being when they heal naturally. 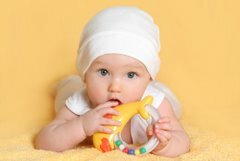 Cradle cap is very common among newborns. It's a form of dandruff. Your baby may experience a mild form of this cradle cap, which looks like dry, flaky skin on the head. A more severe case may appear more oily with yellow patches, which my daughter had experienced. The best remedy to alleviate this symptoms is by using extra-virgin olive oil. Just gently massage the oil directly onto the baby's scalp. You can use a soft brush, your fingers or a soft wash cloth. Wash with baby shampoo and rinse the baby's head thoroughly with warm water. You should notice a big improvement in the baby's scalp. No pain, no medicine, no fuss! Diaper rash is another common problem for babies. It's painful for any parent to watch their baby suffer. So, what is the best remedy for this common problem? Again, extra-virgin olive to the rescue. I'm sure there are other great home remedies but extra-virgin olive oil does the job well! Just mix 2 teaspoons of EVOO with 1 teaspoon of water. Apply it on the baby's bottom. Can a remedy get any simple. You'll love this ointment! Learning about the health benefits of extra-virgin olive oils.